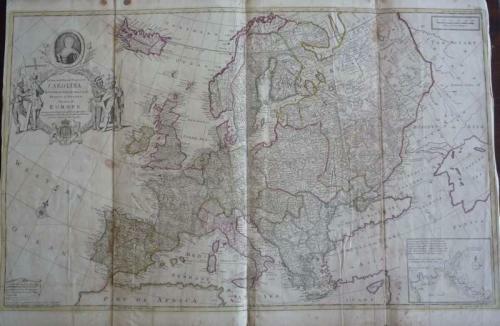 Title: 'To Her Most Sacred Majesty Carolina Queen of Great Britain, France and Ireland, This Map of Europe According to the Newest and most Exact Observations is most Humbly Dedicated by your Majesty's most Obedient Servant Herman Moll Geographer'. A large map of Europe. In unrestored condition, with some small margin chips, reinforced centrefolds, two six inch tears (that are taped to the verso and virtually undetectable at the front). Minor overall toning, a small hole in the engraved area, a 4 cm centrefold split, and minor spotting.